What Are Tafoni So Puzzling? The extent to which researchers define tafoni by distinctive structures and patterns or by characteristic weathering and internal processes gets to the heart of the controversy surrounding this geologic weathering pattern. For Martini (1978), the tafoni pattern “is a landform and refers to weathering conditions and processes that lead to formation and maintenance of the morphological form”. I believe tafoni are scale-independent, geometrically-similar structures created by a diverse and variable assortment of physical, chemical, and biological weathering processes. Confusion arises because researchers tend to use different terminology to describe similar looking cavernous weathering features. Trenhaile (1992) writes in his book entitled The Geomorphology of Rock Coasts, “the lack of a precise definition of honeycombs, tafoni, and other related forms makes it difficult . . . to determine the meaning of the terminology as it is used by different workers”. Mustoe (1982) recognized that the nomenclature is not standardized and justified a terminological distinction between small and large tafoni, in part, because tafoni of different orders of magnitude do not always occur together on the same rock surface. Other researchers also describe large, meter-sized cavities as tafoni and call similarly shaped, millimeter- to decimeter-scale, cell-like, cavities honeycomb, honeycomb weathering, alveoles, alveolar weathering, and small tafoni. Despite differences in scale and similarities in form, no established quantifiable distinction exists for tafoni of size, shape, or cavity frequency per rock surface. Tafoni develop over a range of scales, and many different weathering processes create the tafoni pattern; yet, little is known regarding how tafoni initiate and what controls the spacing of the cavities. Further complicating fully understanding tafoni is that tafoni develop over spans of time, ranging from decades to millions of year, depending on climatic and lithologic constraints. It seems probable that larger tafoni are more common in arid settings and smaller tafoni more typical in wetter settings. Exceptions. Some cavernous rock structures may not be tafoni. 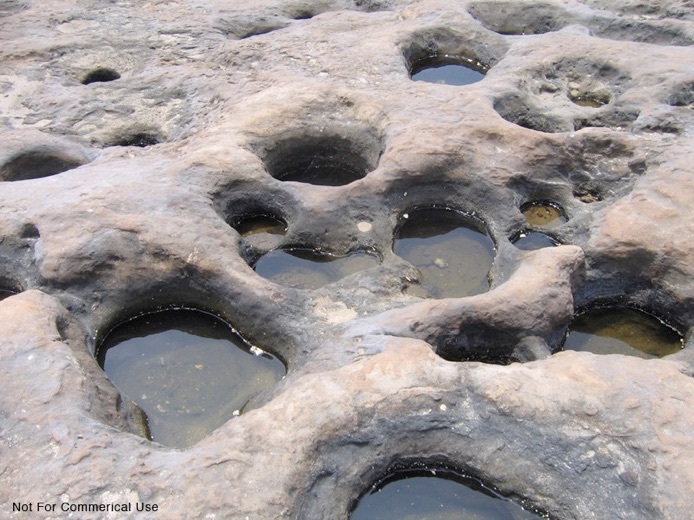 For example, karst, littoral caves, marine potholes, and animal borings can appear similar in form to tafoni but form by different processes. •Karst and caves in limestone are a class of cavernous landforms formed by a particular type of chemical weathering process (the dissolution of carbonate rocks) and occur on a wide range of scales of observation. Yet, the karst form appears categorically different from tafoni; the shape of the walls between karst pits are sharp and the cavities tend to be relatively shallow. Karst topography is often jagged, and solutional weathering creates furrows or channels that separate knife-like ridges; on the other hand, a tafone has a rounded structure and the smooth walls are relatively deep. Despite some similarities in weathering processes (e.g., salt can chemically etch silica grains on tafoni backwalls), karst pits and kilometer-scale underground caverns are structures different from well-rounded tafoni. •Littoral caves are not types of tafoni either because they are made primarily by erosive forces rather than by biological, chemical, and/or physical weathering processes. •Potholes tend to occur on horizontal rather than inclined surfaces. They develop from the overland flow of sea and river water coupled with the grinding action of sand, gravel, and boulders, and are geometrically distinct from tafoni (Tschang, 1974; Martini, 1978). 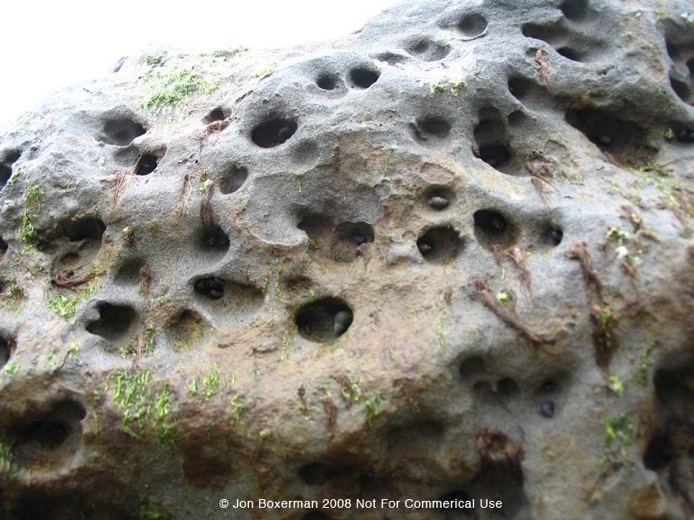 •Pholad borings occur in a packing pattern and are biologically created tafoni-like cavities. The biochemical and physical interactions of the organism inside the cavity makes this a strong candidate. But erosional forces may dominate and this may not be a weathering formation but an erosional one. The cavities appar unusually deep relative to the diameter of their opening compared to tafoni of the same scale in similar sandstone, suggesting that pholad borings are rapidly deepened, or bored by animals.